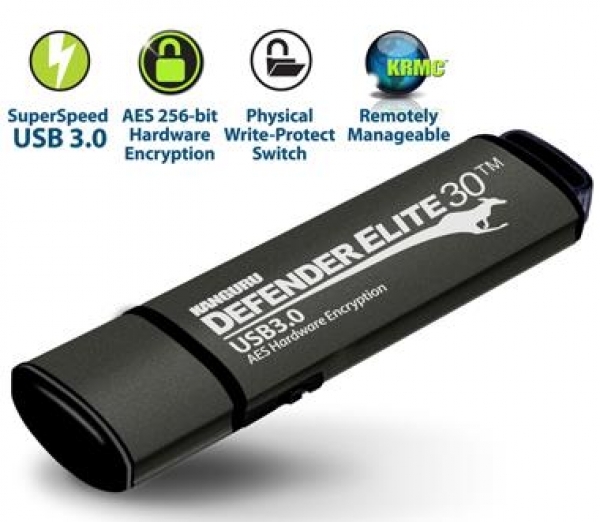 The Kanguru Defender Elite30 USB3.0 hardware encrypted flash drive is loaded with security features and convenience. With a physical write protect switch, AES 256-bit hardware encryption, Superspeed USB3.0 interface and remote management capabilities, this is one impressive flash drive. The SuperSpeed USB3.0 makes the Kanguru Defender Elite30 one of the fastest drives on the market with maximum performance data transfer read speeds of up to 230MB per second and max write speeds of up to 85MB per second. The convenient physical write protect switch enables the user to quickly switch back and forth between read only and read/write modes to prevent overwriting files if desired. Furthermore, all Kanguru Defender USB drives are fully protected from any potential risks associated with BadUSB.